By now, many in the business community know about the City of Birmingham and Congresswoman Terri Sewell’s tremendous efforts to create a National Park in the Birmingham Civil Rights District. A National Park, which would include A. G. Gaston Motel, 16th Street Baptist Church, Kelley Ingram Park, the Birmingham Civil Rights Institute, the Fourth Avenue Historic Business District and Bethel Baptist Church, would be operated by the U.S. National Park Service, attract thousands more visitors each year from all over the world, and be the first National Park in Alabama and one of just a small handful in the Southeast. Visitors would experience first-hand how a community once known as “Bombingham” could progress into a global leader in human rights education, policy and research. As we near crunch time – President Barack Obama will soon be presented with the decision to sign an executive order to make our National Park a reality – the Birmingham Business Alliance is calling on the region’s business community to support the tremendous effort of the City of Birmingham and Congresswoman Sewell. In addition to signing a petition of support, we encourage business leaders to attend a public meeting scheduled for 5:30 p.m. on this Thursday, October 27, at 16th Street Baptist Church with National Park Service Director Johnathan Jarvis and U.S. Secretary of Interior Sally Jewel, who will be the one to recommend that the President sign the executive order. Capacity attendance at 16thStreet Baptist Church would send a message to Washington that we are committed to a National Park in our community. Having a National Park in Birmingham would have a significant economic impact on jobs and the local tourism and entertainment industries. National parks support nearly $30 billion in national economic activity annually and more than a quarter million private-sector jobs. 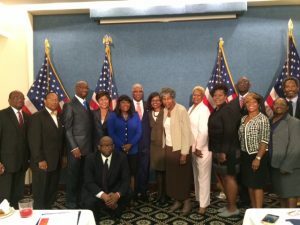 Nan Baldwin of the BBA, third from right, with Congresswoman Terri Sewell and Birmingham Mayor William Bell, center, and a delegation from Birmingham in Washington, D.C., to lobby for the Birmingham Civil Rights National Historical Park. It would also mean continued commercial revitalization and opportunity around an already major tourist attraction – just steps from two of the state’s largest employers, AT&T and Alabama Power Co., and several blocks from the Southeast’s largest technology incubator, Innovation Depot, and a forthcoming Innovation District that will attract knowledge-based companies and talent from across the world. The University of Alabama at Birmingham’s (UAB) new Institute for Human Rights is a brief walk or bike ride south. Birmingham’s Fourth Avenue Business District and Carver Theater could enjoy new life – a surge of young entrepreneurial spirit mixed with some of Birmingham’s oldest black-owned retailers and history-making jazz musicians. Visitors to the National Park would see: the nearby theater district with the renewed Lyric and Alabama theaters and the soon-to-open Pizitz Building and its innovative Food Hall; the Birmingham-Jefferson Convention Complex, its entertainment district Uptown and a potential stadium for UAB football; a business district 85,000 people strong and home to Alabama’s only Fortune 500 company, Regions Financial Corp.; and a world-class medical district at UAB, which receives over $400 million annually in federal funding for research. We believe the combination of a National Park and cutting-edge, federal government-supported medical research is a winning combination and a smart investment. A National Park in Birmingham’s Civil Rights District would further knit our community together and solidify efforts more than 50 years in the making to honor the city’s past to build its future – a future built on inclusivity and sustained by diversity, both in life and business. Nan Baldwin is Vice President of Regional Development for the Birmingham Business Alliance. She has been working with the City of Birmingham and Congresswoman Sewell to support a National Park designation for Birmingham’s Civil Rights District.